A previous graduation at ISU. Thousands of Iowans will receive college degrees this weekend, with the biggest fall commencement ceremonies taking place in Iowa City and Ames. A few of those students, including Alejandro Martinez, will become the first in their family to graduate from college. Martinez, who’s from Tama, says his parents are thrilled. 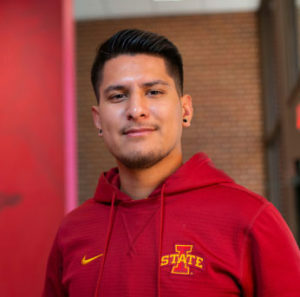 Martinez is graduating from Iowa State with a bachelor’s degree in kinesiology and health. He plans to attend graduate school next fall to study occupational therapy. In addition to making his parents proud, Martinez is hoping to impress his 11-year-old brother. Officials at ISU say over 2,300 students are completing their degrees this week. Graduation ceremonies are taking place tonight and tomorrow afternoon (Saturday) at Hilton Coliseum. In Iowa City, about 1,640 University of Iowa undergraduate, graduate, and professional students are receiving degrees in several ceremonies that began Thursday and continue through Sunday. The Fall Commencement program at the University of Northern Iowa will take place inside the McLeod Center on the Cedar Falls campus at 10 a.m. Saturday.